DC-Laus Deo: Lincoln: "There is no place I so much desire to see is Jerusalem." 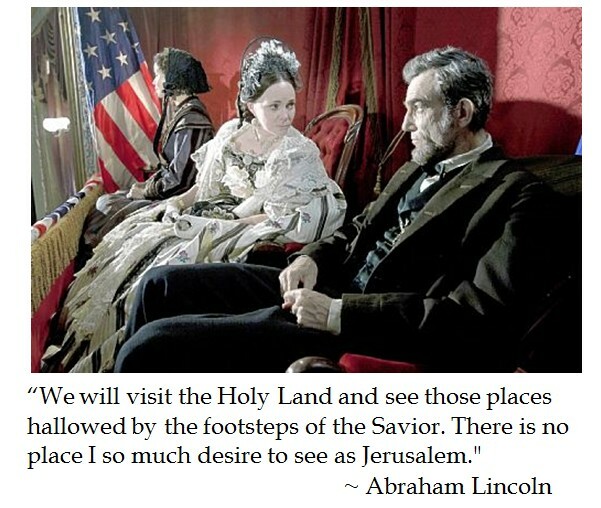 Lincoln: "There is no place I so much desire to see is Jerusalem." As we commemorate the Sequicentennary of the assassination of our sixteenth President, it is worth noting what were Abraham Lincoln's last words. On Good Friday of 1865 the President had taken his wife on a carriage ride and later to see the play "Our American Cousins" at Ford's Theater in Washington, DC. The Civil War was coming to a victorious conclusion. Although Lincoln had just began his second term, he was contemplating his post presidency plans with his wife Mary Todd Lincoln. President Lincoln did not want to return to Springfield, Illinois after his term ended. He longed for anonymity abroad, including visiting Jerusalem. It is said that Lincoln whispered in his wife's ear about visiting the Holy Land before John Wilkes Booth shot him. It is ironic that Lincoln had been an aggrieved atheist (or perhaps a soul lashing out of anger at God) for part of his life. But the many tragedies which President Lincoln suffered as an adult along with the weight of the War Between the States was met with good Christian pastoring. Lincoln transformed the suffering into a holy impulse. Could this be just hope filled hagiography, as Mary Todd Lincoln was not exactly a stable source. Maybe. But it is much more believable than the LGBTQQ? community revisionist history claiming Lincoln as a bisexual --what stuff!